Speaking of data breaches, 2017 definitely scores high in comparison with previous years. This year, massive data breaches were disclosed that affected millions of computer users worldwide. 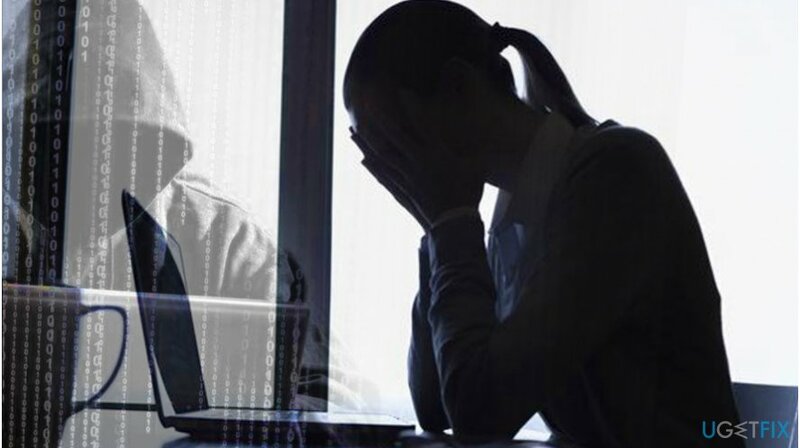 However, hackers are active every year, and even companies using the best security measures to protect user data can fall victims to a cyber attack that aims at private user data. Data that fraudsters target typically includes usernames, full names, passwords, credit card details, addresses, social security numbers and other details that cannot be changed in a minute. Fraudsters use collected data for all types of fraudulent purposes, for instance, identity theft. In addition, they may use collected data to create personalized phishing emails containing malware and send them to you. Finally, your data can be quickly spread across dark web forums or be sold to other scammers who have very specific ideas on what to do with it. Finally, scammers can use your email account to access associated accounts, steal your money or damage your reputation via your social media accounts. The list goes on and on as hackers are very creative when it comes to using stolen user data. We are sure that you have heard about these data breaches or at least about some of them. Now that the damage is done, the question is, how can you protect yourself after a data breach? What can you do to prevent scammers from using your private information for illegal purposes? UgetFix team suggests using the following tips to protect your personal data in case attackers managed to steal it during a data breach. Try to gather as much information as possible. Figure out what data was stolen, was it encrypted, and how losing such data can affect you. Contact financial institutions. If you already know that your sensitive data was breached, let your bank or mortgage lender know. Another thing you can do is to set up a fraud alert. Doing so requires your identity verification before performing any changes or actions regarding your bank account – opening a new one, issuing a credit card or increasing its limit. Control billing and financial statements carefully. Keep an eye out for any suspicious activity. See what the business or organization that put your security at risk has to offer in response to the data breach. For example, you may be offered to get free credit card monitoring services (that usually come at a cost). Change all the passwords you can. Cybercriminals can quickly use data collected to take over your social media, bank, shopping accounts and use them for their own benefit. Make sure you use strong passwords and update them every 90 days just to add that extra protection layer. Freeze your credit file on websites of credit bureaus. The reason why we recommend this is that hackers could use stolen data to apply for credit at a lender or other company. If you are married, your spouse should freeze their credit file too. React to bills from strangers as they might indicate that someone has opened an account on your behalf. In such situation, you should reach out to your creditor immediately. File your taxes – the sooner, the better. If your social security number was exposed to scammers, they might use it to get a tax refund. Watch out for phishing emails that fraudsters might compose using your personal data. Having so much sensitive information about you allows scammers compose persuasive messages that look like they’re sent from business or organizations you actually have business with. Therefore, be extremely cautious when opening emails you receive! ^ Matt Burgess. That Yahoo data breach actually hit three billion accounts. WIRED UK. Future Science, Culture & Technology News and Reviews. ^ Identity fraud and identity theft. Action Fraud. UK's National Fraud and Cyber Crime Reporting Centre. ^ Nick Wells. How the Yahoo hack stacks up to previous data breaches. CNBC. Stock Markets, Business News, Financials, Earnings. This entry was posted on 2017-10-31 at 04:02 and is filed under News.